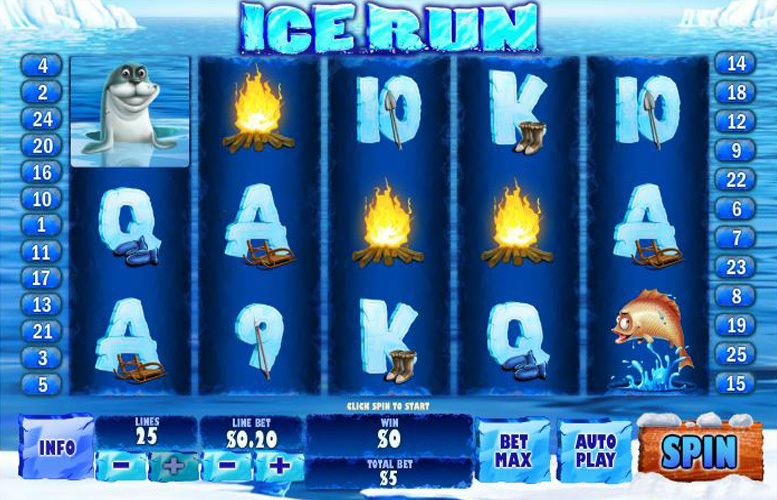 The Ice Run slot from Playtech takes players to a wintery wonderland of huskies, igloos, and snowmen. The design is quite typical, featuring five reels and three rows, whereas the extensive bonus features make the slot stand out amongst its peers. Great bonus features. There’s a total of three different ones to activate which only increases player enjoyment and its longevity. The machine itself is stylish, and fun. The soft blue colour scheme is nicely broken up with vibrant cartoony characters, and the game is almost as good to look at as it is to play. The huge number of betting options on each line gives players ultimate control over their wagering. Native woman = 4,000x the line bet. Otter = 500x the line bet. Fire and Fish = 200x the line bet. 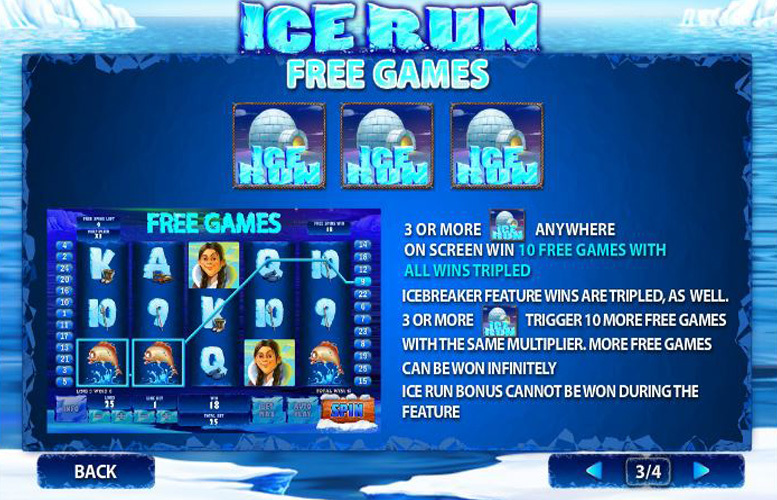 One of the best things about the Ice Run slot machine is certainly its extensive range of bonus features. There’s a total of three which are all unique, and this makes the gameplay experience richer for the player. The Icebreaker bonus is awarded in two ways. Firstly, if players land the “wild” native fisherman on the centre of reel three, all wins are paid out, then the wild expands up and down, and the reels spin twice more, each time the player receives further payment. Even better, if players land the same symbol anywhere else on reels two, three, or four then the wild expands across all the reels where the bonus can be activated, and the reels are spun once again. The chances of hitting five-of-a-kind multiple times here are huge. 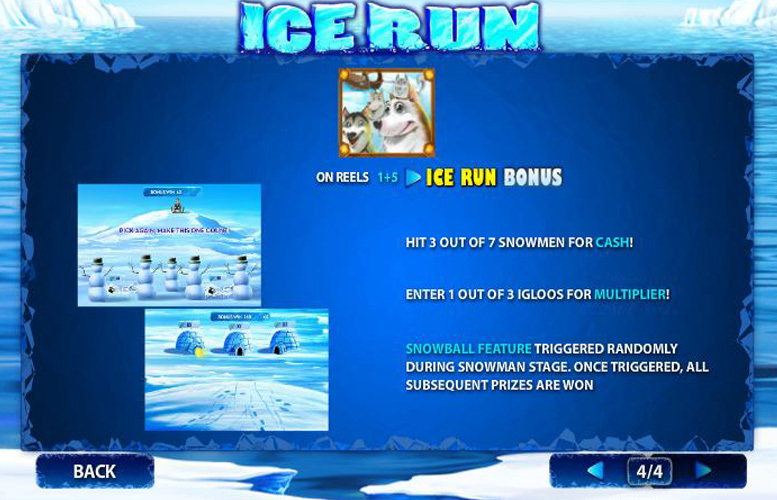 Landing the Ice Run igloo three times on any reels will award the player with 10 free games with all winnings subject to a 3x multiplier. If players are lucky enough to hit three more igloos during these games, they will be awarded with 10 more spins. This dynamic can continue indefinitely too. If players land the sledding hounds symbol on reels one and five simultaneously they’ll activate the Ice Run Bonus. They’re then taken off to a wintery field where they pick snowmen to reveal cash prizes. They must select any three of the seven icy figures, and each of the rewards are combined. Following this, players are asked to enter one of three igloos to discover how large the multiplier applied to their wins will be. As if all that wasn’t enough, there’s also a snowball feature. This is triggered randomly during the snowman stage of this feature. Once active, the player is awarded all the prizes under the seven snowmen! Queen, or Jack = 75x the line bet. 10, or 9 = 50x the line bet. 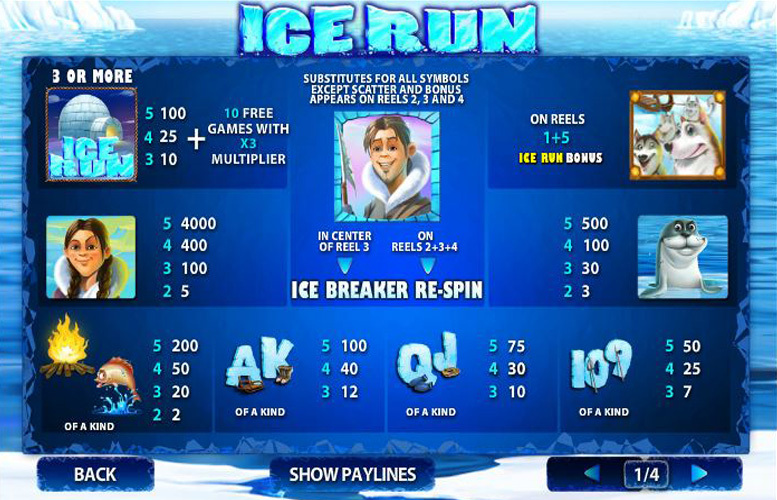 There’s a huge amount of variation between the maximum and minimum bets on the Ice Run slot machine. Whilst players do not have a specific option to change the value of a coin, it doesn’t make any difference to the actual playing of the game. The developers have made it so that there are no “coins”. Instead players can just adjust the value of their line bets directly. They select from a large range of values between 1p, and £50 per line bet. When the lines themselves are set to maximum, this makes the largest possible bet a huge £1,250. By contrast, the smallest wager players can make is 1p (with all values set to minimum). 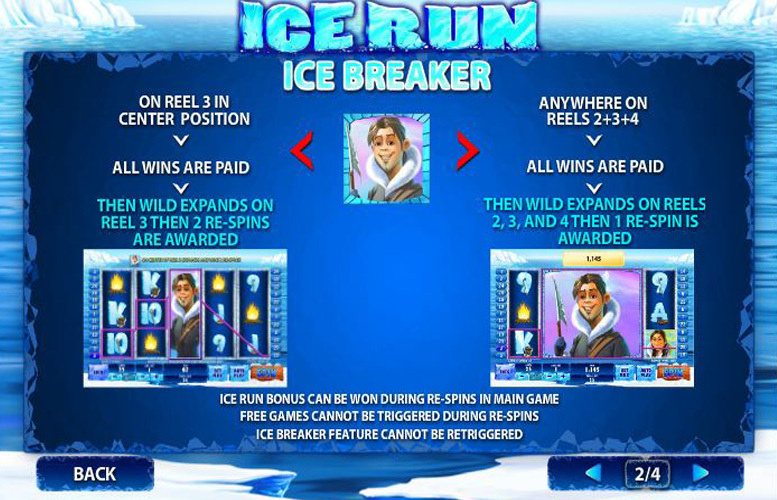 The Ice Run slot is a great gameplay experience for players. There are so many exciting features on the machine, and it’s a pleasure to look at too. The inclusion of all the features that are expected of slots these days, plus several others makes this machine one of our absolute favourites. This game has a rating of 5 / 5 with 367 total reviews by the users.